In what appears to the the first money laundering conviction in the East Caribbean island of St. Lucia, a Venezuelan national was sentenced to twelve months in prison, after the authorities found a treasure trove of cash in his hotel room, and within his stomach. Reglio Jesus Patino Reyes, a bulk cash smuggler, had dollars, Euros, Bolivars, and even some Chinese currency in his room, and more bulk cash was found when hospital action result in his expelling additional notes. The significance of this case: money launderers continue to find ways to repatriate drug proceeds. 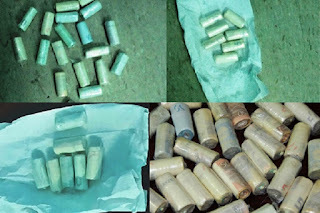 The presence of Euros indicates that the money found was probably not earned in North America, but in Europe, which is seen as a developing, not declining, market for narcotics. Did he smuggle the bulk cash across the Atlantic, on a commercial flight, and is this now a major route for narco-profits returning to the cartels in Colombia and Venezuela ?